comfy winter clothes, at last. it makes sense really with the weather we've had today; it's been bloody freezing! i've also noticed that in the entire time i've been doing full length outfit posts for my blog i've never once photographed my hair up. which is amusing as it's pretty much how i always wear my hair on a daily basis. so in terms of a fashion post this outfit post is bland at best, but it's what i like and that's what's important to me. obviously me being me has to add a bit of something to it with the leather trousers though. the trusty ol' things. i wish this jumper was available online for me to link for you as they also do it in cream and navy (which i'm also lusting after), and it wasn't expensive either at only £14.99. in other news i was meant to be at vogue's fashion night out in manchester tonight which i was super excited about, but unfortunately as i have work at 8am tomorrow morning i wouldn't get home until 12 o'clock or later. especially as i would have to drive there and back too i just think it would be a little too much. even so i'm envious of everyone going and hope they all have an incredible time! next year will be my year; london fashion week and FNO i'm going to make sure i do them all. 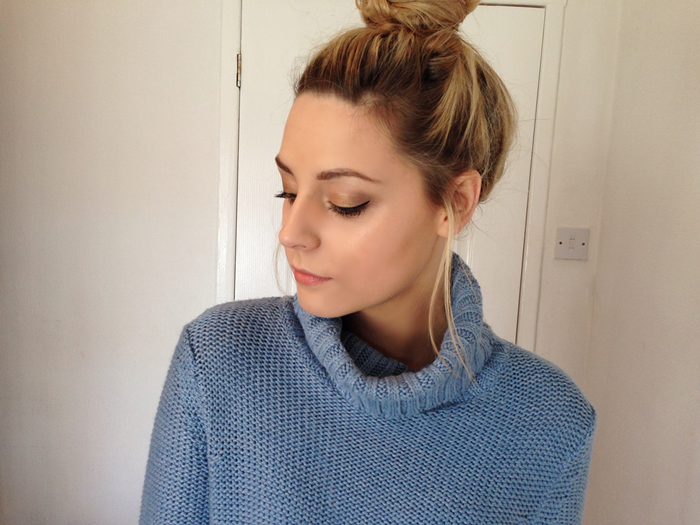 I love this jumper!! It looks amazing, but I dont think i could pull it off! I did opt for my chunky green jumper today though and I definitely needed it! Roll on winter!! 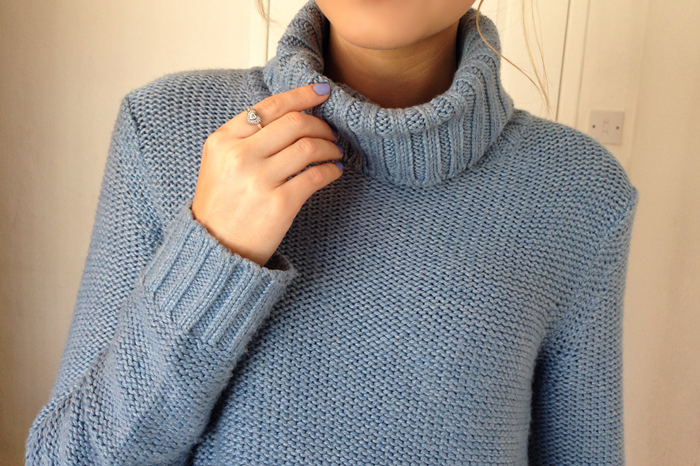 The colour of the jumper is lovely, and your skin is flawless! I'm so excited that it's getting colder definitely going to go out and get some cosy knits :). Love the jumper and I really need some leather trousers. Your hair looks so gorgeous up! Ooh I want this jumper! Perfect outfit, wish I could pull off grey! To me, this is the perfect winter outfit! you look incredible, you really suit your hair like this! this outfit looks so comfy, you really suit your hair like this :D lovely! I love this look! So polished and chic.